To maintain what few shreds of clear conscience I have remaining I must begin this review with a nod to transparency and reveal a potential conflict that might lead readers to declare bias in my objectivity. I personally know the owner of this establishment. We went to high school together. I suppose you could say we are friends. And I mean friends in the Facebook “I wonder what so-and-so is doing with their life” sense not the BFF “Who wants to come over this weekend, drink wine, each sushi, and watch a John Hughes movie marathon” sense. All in all, pretty innocuous stuff. Ah, but here’s the tricky part; for those five years of high school I had a slight [ok] persistent [FINE!] vicious crush on the owner. I’m not too proud to admit it though I’m boundlessly grateful many modern technologies were non-existent twenty-five years ago. I’m just saying that sixteen-year-old-me and Snapchat would not have made for a particularly romantic wooing. In light of this admission you have a significant decision to make. Am I still attempting to curry favour with this woman after twenty-three years, desperately hoping a positive review will lead to sudden fulfillment of teenage fantasies? Or, has five years of heartbreak been festering unchecked for two decades and I am now seeking revenge via an unflattering review in one final spiteful reprisal? Or maybe, just maybe, I’m simply writing an honest review of an establishment I had lunch at and happen to have a small connection to. Now that I have that out of the way, I have yet another asterisk to affix to this review. Fear not, this one is not nearly so titillating though it is admittedly peculiar. I am about to write a review for a coffee shop and I don’t drink coffee. I hate the stuff. I tried it once and needed four packets of sugar and three creamers to choke it down which struck me as defeating the purpose. I haven’t had it since. I even made it through five years of university without a drop so, yeah, I seriously do not like coffee. Luckily Sangha Bean is much more than a simple coffee shop. Standing sentry at the westernmost entrance to Canada’s renowned mountain National Parks is the small city of Revelstoke, British Columbia. Founded along the Columbia River in the heart of the Columbia Mountains with the building of the Canadian Pacific Railway, beautiful Revelstoke is an alpine oasis on the TransCanada Highway. For those of us traveling west from Alberta it is also the last snippet of civilization before exiting the greater Rocky Mountain complex into the retirement and vacation hotbeds of the Shuswap and Okanagan. It is also a solid five hour drive from Calgary, Alberta which is home for a significant number of those retirees and vacationers. This makes Revelstoke a perfect spot for refueling both the vehicle and the body, not to mention a fine destination all its own for skiers, hikers, and cyclists. Steeped in railroad history along with mining, forestry, and hydroelectric power generation, Revelstoke is evolving. Harvesting the earth’s rugged bounty is giving way to a growing tourist economy centering on mountain recreation and sport thanks to Revelstoke’s substantial snowfall and headlined by the Revelstoke Mountain Resort. This evolution is bringing a new type of resident, a new type of visitor and a new type of entrepreneur to Revelstoke; a New Age transformation as the lumberjacks are replaced by hippies, if I may resort to witless stereotypes. Nowhere is this shift more evident than in the modern, eclectic businesses like Sangha Bean that enliven a rejuvenating downtown core. 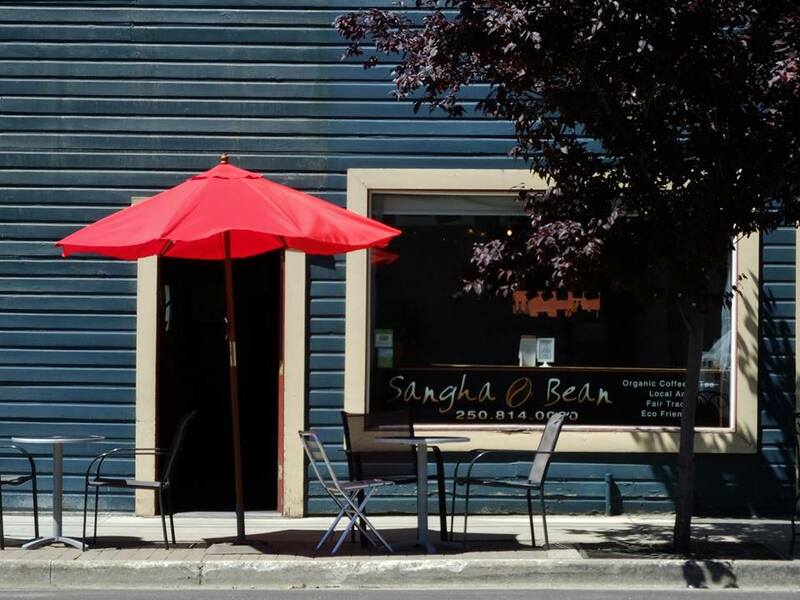 Front entrance of Sangha Bean courtesy of Sangha Bean Facebook page. There is no gaudy neon signage or tell-tale bland architecture to signifying a chain restaurant. Instead, the only hints Sangha Bean’s existence are a couple tables and chairs found on the sidewalk out front and a classy, unassuming sign in the front window of a quaint blue, wood-sided building. 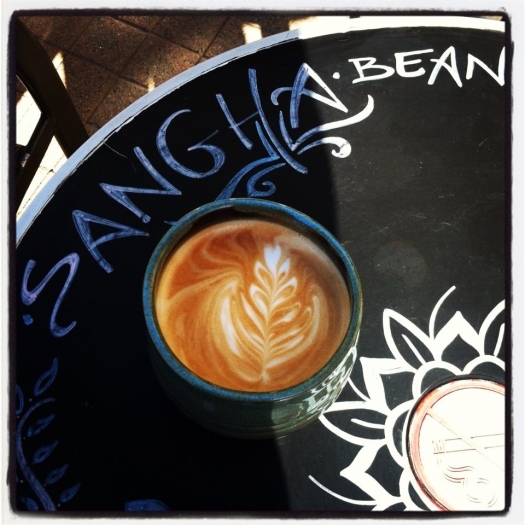 In fact, Sangha Bean could easily be missed if one weren’t specifically seeking it out. Yet it’s this simplicity, this unassuming presentation that invites one to take a closer look. 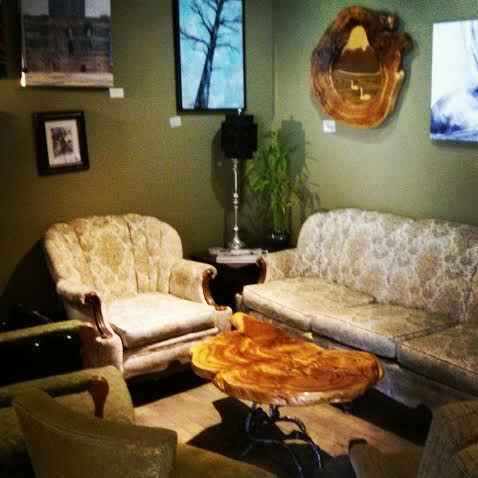 Step inside Sangha Bean and your first impression is that you’ve entered an eccentric’sliving room. But take a few moments to explore and you’ll soon realize there is a purpose here, a philosophy, a spirit. Repurposed antique furniture mixes with handcrafted tables. 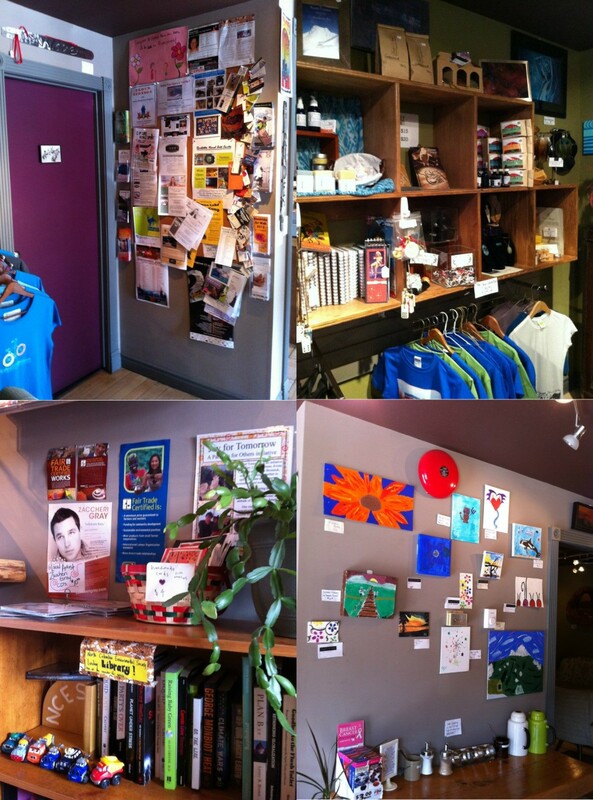 Handmade artwork, crafts and goods adorn the walls and display shelves like a tangible Etsy. Notices for local charities, help organizations and informational meetings are pinned up in the bathroom. It’s welcoming and homey but also gives you pause as if your frantic life has been calmed for just a moment; no small feat for someone coming from Calgary. Then there is the food. As I mentioned earlier, I don’t drink coffee and neither does my wife nor do my kids who remain caffeine free entities. So it is the food we come for and while the menu may be concise it is certainly not lacking in appeal. Sangha Bean does all day breakfast as well as rich, warming soups which must be a delight on a cold winter’s day. We were there in August so chose to invade the wraps section of the menu. I had a black bean wrap which was so stuffed with goodness that it was the diameter as my upper arm (this may say more about my sad lack of bicep development than the actual size of the wrap but my point remains; the wrap was big). My wife had a similarly sized veggie wrap which boasted a list of ingredients longer than the side effects warnings on pill bottles. The kids, notoriously picky eaters, enjoyed a simple made-to-order toasted multi-grain bagel; one with butter for the boy and one with cream cheese for the girl. All this delicious food is made with local organic veggies and baked goods (the coffee and tea is fair trade and organic). It is delicious. Road trips can be such a hazard to one’s diet as fast food joints and chain restaurants present a far too easy quick fix to hunger and time constraints. The result is always disappointment and often unpleasant discomfort in regions of the body that don’t react well to curvy mountain roads. Not so with the lunch we had at Sangha Bean. 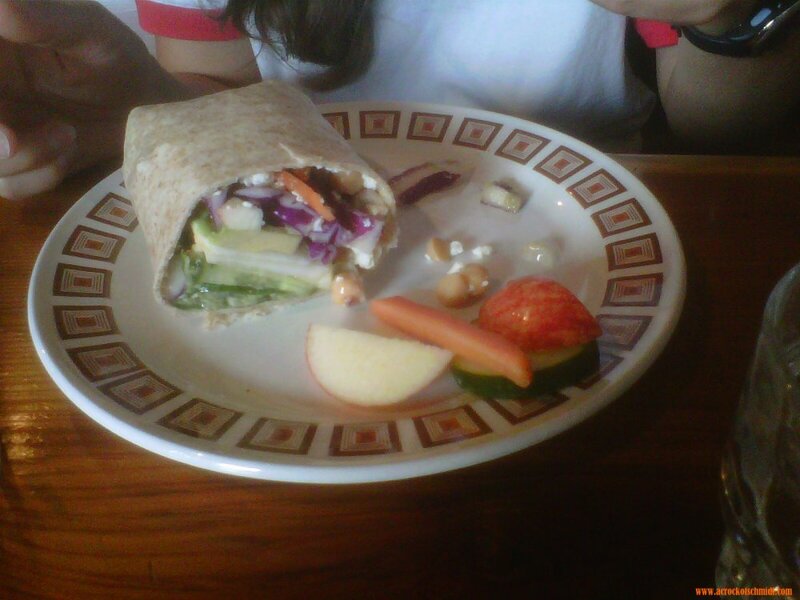 It was flavourful, colourful, healthy and satisfying and didn’t lead to any regrets 30km down the road. Everything is made to order within easy view of customers in the small kitchen behind the main counter so don’t expect service to be quick. This isn’t to suggest service is slow, but it takes time to put these treasures together rather than just grabbing the next bun creation under a heat lamp. Use the time to chat with friends or look around at the artisan wares on display or you can simply stare at the large wooden table at which you’re seated which itself is a work of art. My only complaint is that the beverage selection for those of us who don’t drink coffee or tea is a bit limited. We had self-serve water from a jug on the main counter which wasn’t terribly cold. Junk drinks obviously don’t fit with the philosophy of the place and it isn’t a licensed establishment but it would have been nice to have a selection of juices or at least ice cold water. Then again, I’m the idiot who doesn’t drink coffee complaining about the beverage selection in a coffee shop. The staff is friendly and helpful much like the owner who you’ll find there most days. There’s a joy in this place and it’s obvious the owner wholeheartedly believes in what she’s doing and what her shop represents. This gives Sangha Bean an authenticity missing in many similarly styled restaurants in more famous (i.e. monied) tourist spots like Canmore or Banff. Sangha Bean Artisans courtesy of Sangha Bean Facebook page. I’ll be honest I’m not exactly the ‘granola’ type. I don’t do yoga or organic or handmade perfumed soaps. And, of course, I don’t do coffee so frequenting coffee shops of any kind, be it Sangha Bean or Tim Horton’s, isn’t high on my priority list. Had I not known the owner of Sangha Bean in a previous life I doubt very much I’d ever have discovered it. That would have been a sincere shame because it’s really a great little spot. I’d recommend Sangha Bean without hesitation to anyone. Yes it may cost a little more and take a little longer than the fast food joints but it’s absolutely validated in the product and the experience. The locals must revel in having regular access to such a neat place. I’m sure coffee and tea drinkers love the specialty beverages. For those of us only driving through Revelstoke or staying for a few days of skiing, it’s a treat worth the extra effort to enjoy. I give Sangha Bean 4 ½ Baby Dill Pickles out of 5. And be sure to tell the owner you heard about Sangha Bean from me. She won’t give you a discount but I’m sure she’ll be happy to tell you funny, if a tad pathetic, stories about the kid who ceaselessly yearned for her over five years back in the late 80’s. Really, what’s better at lunch than a good yarn?